You may adopt a tendency to wear rose-colored glasses when it comes to affairs of the heart. 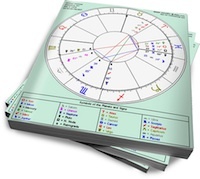 The reason: Poetic Neptune moves into your 5th House of Romance in early February. For the next 14 years it inspires within you a greater propensity to be idealistic about relationships. Don’t abandon romantic notions or the thought that relationships can be soul satisfying. Just keep your eyes open to what’s real rather than just ideal. On March 13th, your keen mind offers you great insights into how to make a relationship work. This is when your planetary ruler, powerful Pluto, harmonizes with expansive Jupiter. Thinking back to last July and October can provide you an extra layer of understanding. This is when these planets forged a similar connection. The Solar Eclipse on May 20th sparks your awareness about how to initiate more intimacy in a relationship. Jupiter continues to travel through your 7th House of Partnership, the sector of your life it has been expanding since last June. During this time it highlights your ability to enrich a current partnership or meet a mate if you are single. When it moves into Gemini and your 8th House of Intimacy on June 11th, it ushers in a time where you strive for more meaningful alliances with others. When serious Saturn enters Scorpio in October, you begin a two-plus year period of redefining your identity. Knowing more about who you are—and truly inventorying what you need—can help you forge even more solid relationships. Neptune in the 5th house for the next 14 years! This is big news. How do you interpret the affects when your natal Neptune in the 8th and progressed Neptune in the 7th? Is it fair to interpret that Neptune will pack an extra power being that it will impact major houses that involve intimate relationships?